A refreshing citrus grass body scrub, followed by a warm shower and a honeysuckle and blood orange moisturizing treatment. All topped off with a glass of prosecco and a tasting of fresh peach sorbet. 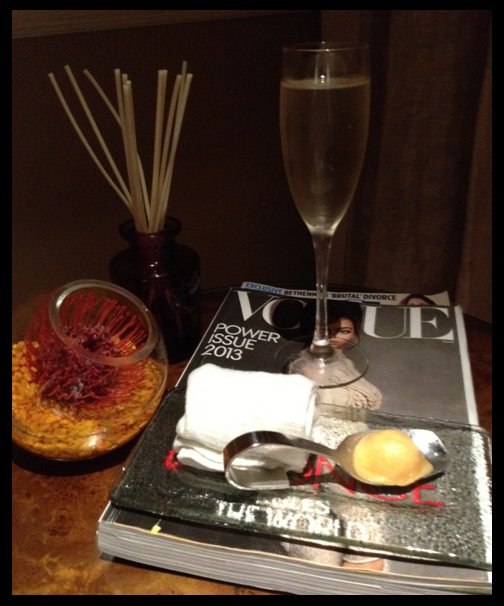 Just another delicious Thursday at The Spa at Four Seasons Hotel Atlanta. Last week, after a long day at my full-time gig in communications at Georgia Tech, I headed over to the hotel's spa for a treatment. (Disclaimer, the spa did comp me the service, however, I’ve long been a fan of this spot and have spent plenty of my own dollars here.) FYI, valet parking is free with validation from The Spa. A few minutes before my scheduled "polish" time, I headed into the cozy relaxation room where you’ll find hot tea, citrus water, and snacks such as yogurt-covered pretzels and nuts. I’ve always loved this particular relaxation room because of the corner seats; you feel like you’re snuggled away from everyone else. (But note that it is on the smaller side, so it can sometimes be pretty crowded on Saturdays.) Not to mention, they have the best blankets for curling up in before and after your treatment (see the picture). Right on time, Alicia, my therapist, came to get me for my 50-minute treatment. Before and during the treatment, she was fabulous about telling me what to expect next and asking if the pressure of her hands was OK.
For the treatment, I laid on a massage table, and Alicia went body part by body part (e.g., each arm, each leg, back, etc. ), first placing a warm towel on the area and then massaging in the exfoliating body scrub — which smelled amazing and left my skin feeling so refreshed. After she’d done the front and back of each area, she left the room, while I showered off. Next, I returned to the table (which now had sheets on it, instead of towels), and Alicia revisited each area of my body, applying a rich moisturizer (see the picture). By the end of the treatment, the day’s stresses had completely melted away. After I’d put my robe and slippers back on, Alicia led me back to the relaxation room where I was treated to a glass of prosecco and small tasting of peach sorbet. Delish. I enjoyed my goodies while happily curled up in one of those FWABulous blankets, reading the latest travel and fashion mags. The treatment that I received usually costs $165. If that’s a bit pricey for you, never fear. The Spa offers a “happy hour” deal Monday through Thursday from 6 to 8 p.m. You can choose two 25-minute treatments from this menu — and get a glass of prosecco — for $99. So if you’re looking for a way to relax, I recommend giving this fit belle “fit” a try. You might run into me enjoying a happy hour that doesn’t come with calories (except for the prosecco)! OK y'all, I cannot seem to get my Facebook likes to break 250 (I have been at a perpetual 249 for weeks). Help a girl out and give me a “like” if you haven’t already — your help is much appreciated! Until next Tuesday — stay FWABulous!